UW computer science student Kip DeCastro of Casper developed a blockchain code to track a December 2018 shipment of Wyoming beef to Taiwan. Blockchain is a system in which a record of transactions is maintained across a network of linked computers, allowing for safe and secure data transmission. DeCastro and Philip Schlump of BeefChain collaborated on the code used to track the beef. BeefChain, a Wyoming-based company, helps the state’s ranchers command more value from their beef by proving that their products are free range and fairly farmed, while also giving consumers assurance that the products are safe. Rob Jennings, BeefChain’s founder and chief executive officer, says it was the first shipment of beef tracked on blockchain from the United States to Asia. "The University of Wyoming was integral in making this trial shipment a success,” Jennings says. “As a combined effort of the Department of Computer Science, and the Colleges of Agriculture and Business, this project highlighted the strengths of each department and their faculty and graduates. We look forward to working with the university as BeefChain continues to grow." The beef was raised at Murraymere Farms in Powell, Wyo. It was placed in tagged cases with RFID labels and sent to a five-star dining establishment in Taipei, Taiwan. The labels featured a unique digital identifier that enabled the cases of beef to be tracked along the entire supply chain, from plant processing, export, import and to the restaurant. The unique achievement can be attributed to the work of UW’s Department of Computer Science, in conjunction with BeefChain, the Wyoming Business Council and Avery Dennison, a global company specializing in adhesive technologies and packaging materials. It provided the radio-frequency identification (RFID) labels. Technology breakthroughs have enabled blockchain technology to be utilized more extensively in the food industry in recent years. 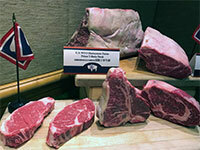 "Partnering with Avery Dennison on this pioneering shipment of Wyoming beef was crucial for BeefChain,” Jennings says. “Avery's cutting edge RFID labels guaranteed our ability to trace the product through the entire supply chain and record the data in our digital ledger."